Thanks to the recently awarded NEH funding, members of the Courtroom 600 project and a panel of national and international experts will meet in Storrs for a two-day charrette in June 2019. 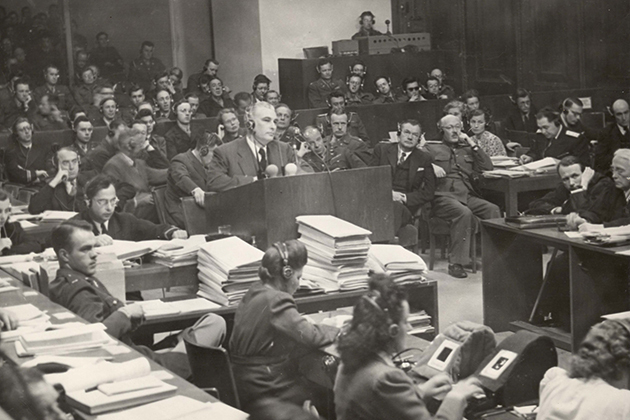 Project collaborators include specialists from the United States Holocaust Memorial Museum in Washington, DC, and the Memorium Nürnberger Prozesse(Nuremberg Trials Memorial) in Germany. They will have the opportunity to don VR headsets, take up the controls, and spend time experiencing the prototype for themselves. In addition to gathering information on possible approaches to the narrative, learning objectives, and visual treatments in focus groups, the software will capture data about user interactions to refine the prototype.